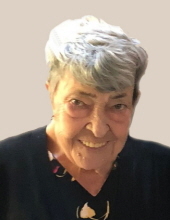 Doris Irene O’Connell, age 79, of Smithland, Iowa, passed away on Wednesday, January 30, 2019, surrounded by her loved ones at her residence of Smithland, Iowa. A Mass of Christian Burial will be held 10:30 a.m., Monday, February 4, 2019, at the St. Mary’s Catholic Church of Mapleton, Iowa. Father Richard D. Ball will officiate. Committal Services will follow in the St. Mary’s Catholic Cemetery of Oto, Iowa. A Visitation will be held on Sunday, February 3, 2019, from 5:00 p.m. to 7:00 p.m., with a Rosary at 6:30 p.m. followed by a Vigil at 7:00 p.m., at St. Mary’s Catholic Church of Mapleton, Iowa. The Armstrong - Van Houten Funeral Home of Mapleton, Iowa is in charge of the funeral arrangements. Condolences may be sent online www.armstrongfuneral.com. Doris was born on April 2, 1939 on a farm outside Oto as the ninth child of Nicholas and Anna (Hehn) Gotto. As the youngest, Doris was mentored and spoiled by all her siblings. She attended Oto Elementary in Oto, and later Oto High School where she participated in chorus, band, drama, and cheerleading for the Oto Bulldogs. The love of her life, Joe O’Connell, also attended Oto High School. The couple was married on January 14, 1958 at St. Mary’s Catholic Church in Oto, by Father Raymond Weiling and celebrated mass faithfully there, until the church closed in 2017. Doris was a lifelong member of St. Mary’s Catholic Church. She was a member of the Altar Society and taught CCD to many children. They moved to the family farm in April 1958, where they raised five sons and two daughters in a four-bedroom, one-bathroom home. Doris worked as a housewife and mother, and passed along her cooking and cleaning skills to all her children. She worked as an attendant for the Election Commision for over 30 years. She also participated in family activities of canning, gardening, walking beans, and cleaning chickens. When she wasn’t caring for her children and their friends, she used her craft skills to make cloth diapers, baby blankets, and afghans. In later years, she transitioned to making kitchen towels and washclothes, plus small holiday craft items to sell at a local craft fair. Her craft legacy was the colorful scratchers, making thousands over the years to share with family and friends. Upon all children leaving home, Joe and Doris built their dream home south of the previous farmhouse in 2002. The upgrade to five bedrooms and three bathrooms made it more enjoyable for extended family to visit and celebrate. Those family members left to cherish her memory are her devoted husband of 61 years Joseph O’Connell of Smithland, IA; seven children: Timothy “Trapper” and Janeen (Shaw) of Odessa, TX, along with Megan and Brett Sowers of Parker, CO and Austin of St. Louis, MO; Brian of rural Smithland, IA, along with Jessica Williams of Houston, TX, Brice of Denison, IA and Nick and Amanda of Omaha, NE; Mark of Sioux City, IA, along with Matthew of Sioux City, IA; Trudy and Joe Pierick of Iowa City, IA along with Philip of Cleveland, OH and Alyson of Atlanta, GA; Patrick and Michelle (Meurer) of Wheaton, IL, along with Abigail of Fishers, IN; Greg and Catherine (Metz) of Cedar Rapids, IA; and Sara and Travis TeGrotenhuis of Hospers, IA, along with Kaden; seven great-grandchildren, and numerous nieces, nephews, and friends. Doris was preceded in death by her parents, Nicholas and Anna (Hehn) Gotto; in-laws Paul and Bernie (Dixon) O’Connell; four brothers: Henry Adam (Joyce), Leo Matthew (Martha), Joseph Phillip (Clara), and Nicholas John, Jr. (Lucille); four sisters: Katherine Mary Lewis (Gene), Anna Margaret Handke (Tracy), Mae Margaret Handke (Herald), and Margaret Frances Ronfeldt (Joseph). Rosary 6:30 p.m. Vigil Service 7:00 p.m.
"Email Address" would like to share the life celebration of Doris Irene O'Connell. Click on the "link" to go to share a favorite memory or leave a condolence message for the family.